SAM Collins today revealed he had no hesitation in accepting the captain's armband for Hartlepool United's league opener. The 31-year-old was named the Pools team captain earlier this week with manager Danny Wilson opting to split the skipper's duties between Collins and club captain Ritchie Humphreys. Collins will lead out Pools at Victoria Park tomorrow (kick-off 3pm) in the opening game of the League One campaign against Colchester after Wilson tinkered with the skipper duties during pre-season. The Pools boss opted to hand the armband to Collins after considering the experience the central defender had amassed when leading out previous clubs Port Vale and Hull. Collins said: "The gaffer pulled me in the other day and we had a good chat about it and he asked me whether I would like to do it and I said definitely. "I think I am the type of lad who tries to lead by example a little bit. Obviously it has come pretty quick but when I was offered it I say I would love to do it. "There are a few more lads in there who have also been captains so the more leaders you have got in the team the better really." Collins claimed splitting the captaincy duties between himself and Humphreys will only benefit Pools on the pitch. Last year's player of the season Humphreys will take on more of the function and official duties – leaving Collins focused on leading the team. "I think me and Humps will mix it in together and share the load," said Collins. "I know when I have done it before, sometimes it can get on top of you a little bit dealing with things with the club as well as the football side of it. a little bit at times. "Those are the things that come with the job though." Collins and Humphreys should both find themselves in the starting line-up for tomorrow's game, although the rest of the first 11 is much tougher to predict. Wilson must decide between Michael Nelson and Ben Clark to partner Collins at the heart of defence and who should fill the troublesome right-back spot, with Jamie McCunnie, Tony Sweeney and Gary Liddle all being used there during pre-season. New signing Ritchie Jones looks likely to be handed his full debut, while Andy Monkhouse, James Brown and Joel Porter should find themselves in the starting line-up. 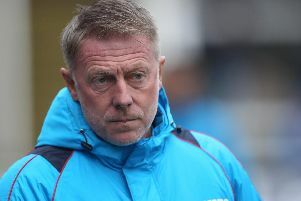 Collins admits the players face an anxious wait for the team, with their visitors also covered in a certain degree of mystery as to how they will react from getting relegated from the Championship last season. The U's have boosted their ranks during the summer with six decent signings, including Steven Gillespie who looked hugely impressive for Cheltenham against Pools last season. "You never know how they (Colchester) are going to approach it," said Collins. "They have signed a couple of players in the summer and we know it is going to be a tough game. "If we play to our capability I think we can get off to a good start." He added: "We have got strength in depth and the gaffer has got some tough decision on his hands. It's a healthy thing to have because then you know on a Saturday you have got to do your job. "You have got to be playing well every week and that's how it should be throughout the team."